Publications and reports prepared by the Department since 1904. Strategic documents including major technical reports and reviews. Numerous maps of South Australia are available but the link to the Atlas of South Australia provides a detailed picture of South Australia today. 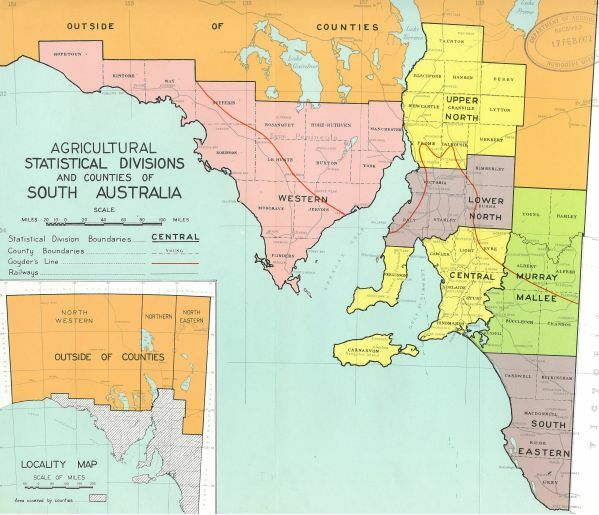 Historically many maps have been produced for numerous reasons for the Department of agriculture and for South Australian agriculture. We have made no attempt to source or accumulate them on the website. The Commonwealth Statistics Map is displayed below to provide a picture of the common statistical boundaries used in compiling agricultural statistics over many years. It breaks the State into six zones based on the original surveyed Counties plus an area in the north of the State that was not broken into Counties. These Counties are further divided into Hundreds and Sections as the basis for land subdivision. Statistics were compiled from hundreds and then amalgamated into Counties and then Statistical Divisions and ultimately Statewide Statistics. Prior to Federation each State published extensive statistical information. After Federation the Australian Bureau of Statistics (ABS) produced publications on individual sectors and a comprehensive publication of State agricultural production statistics. Today these have been contracted into national ABS publications.